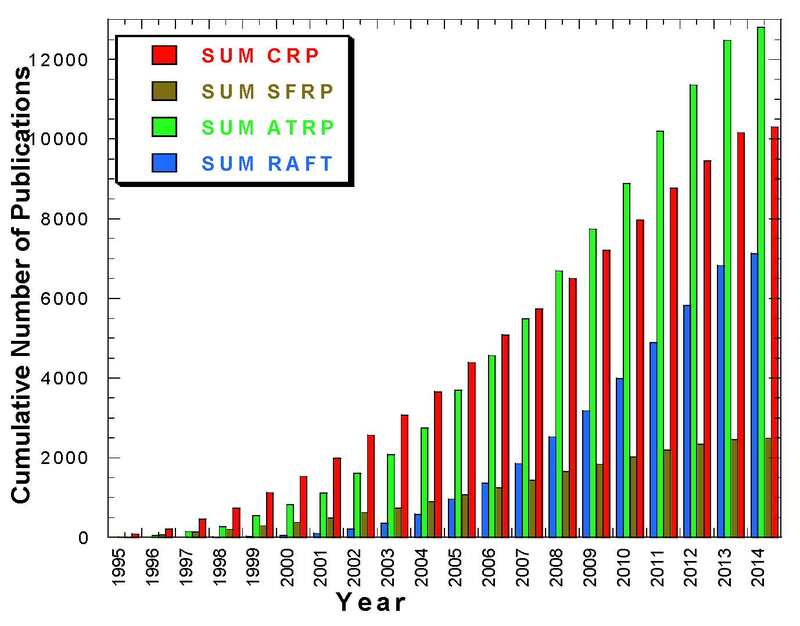 The following figure shows that on March 2014 there have been over 25,000 papers published on Controlled Radical Polymerization, (CRP), since 1993 and more than 13,000 on ATRP since 1995. Throughout most of the pages on this web site we will predominately use the term "controlled" to describe the reactions discussed since the objective of the experiments is to "control" one or more properties of the formed polymer and, since we are discussing radical process and some level of termination reactions are inevitable, the term "living" is not strictly true. The data displayed in the figure above is current to March 2014 and was obtained by conducting a search on SciFinder Scholar using the following terms: "controlled radical polymn" or "living radical polymn" (‘SUM CRP' in the figure), "ATRP or atom transfer (radical) polymn" (i.e. 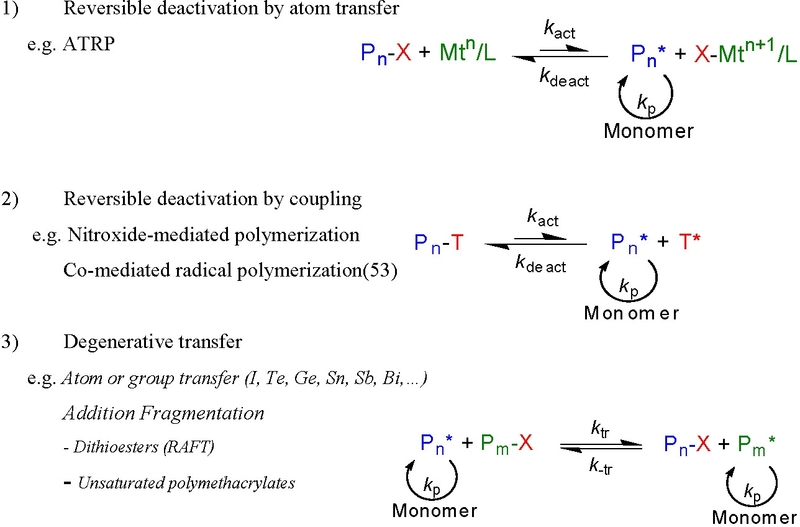 SUM ATRP in the figure refers to ATRP only, this does not include terms like metal mediated or metal catalyzed radical polymerization), "NMP or SFRP or nitroxide mediated polymn or stable free polymn" (‘SUM SFRP') and "RAFT or reversible addition transfer or degenerative transfer or catalytic chain transfer" (‘SUM DT'). The latter two terms were refined with a term "radical polymn" since they coincide with other popular abbreviations used for N-methylpyrrolidone or raft-associated proteins. Applications include coatings, adhesives, surfactants, dispersants, lubricants, gels, additives, novel thermoplastic elastomers, electronics, health and beauty products, biomaterials, drug delivery systems, in fact almost any market requiring a material with a specific set of well defined properties. There is a lot of overlap between the terms but the figure does show that there has been a continuous increase in the level of interest to use the various controlled polymerization procedures for the preparation of functional materials. The concept of CRP that arose from this integration of knowledge is that a controlled radical polymerization process requires establishing/selecting conditions that allow, or create, a dynamic equilibrium between a low concentration of active propagating chains and a large mole fraction of dormant chains, which are unable to propagate or self-terminate. In NMP and ATRP the further the activation/deactivation equilibrium is shifted towards dormant species, the greater the decrease in the concentration of active propagating chains and the less significant termination becomes compared to propagation. The dynamic equilibrium required for control over each of the three major CRP processes is shown below. Recent advances in all of the CRP procedures have reduced the clear differences that once existed between these three widely applied means of controlling a radical based polymerization and the following figure is one way of viewing this merging, or overlapping of CRP procedures. The center of the diagram is occupied by a procedure abbreviated as ATRP/DCT (hv) which is part of the most recent addition to page 4 of this web site where a section describing ATRP conducted in the presence Initiators containing Radically Transferable Groups is detailed. all of these objectives are accomplished by formation of a dynamic equilibrium between a low concentration of propagating radicals and an excess of dormant species. The work of the Matyjaszewski group is summarized within this web page. As noted above, in the case of an ATRP reaction the appropriate selection of suitable catalyst complexes that allows an ATRP to be conducted in a variety of reaction media is based not only on the fundamental work on transition metal catalyzed ATRA, or “Kharasch,” reactions, but also on understanding redox properties(33-34) and stability constants of transition metal complexes. (35) Together they provide the tools for catalyst selection summarized in the “Fundamentals of ATRP” and detailed in the “Mechanism and Catalyst Development” sections of this web page. (2) Jakubowski, W.; Spanswick, J.; Mueller, L.; Matyjaszewski, K. In PCT Int. Appl. ; (Carnegie Mellon University, USA). WO 2007075817, 2007; p 65pp. (3) Min, K.; Gao, H.; Matyjaszewski, K. Journal of the American Chemical Society 2006, 128, 10521-10526. (4) Simakova, A.; Averick, S. E.; Konkolewicz, D.; Matyjaszewski, K. Macromolecules 2012, 45, 6371-6379. (5) Matyjaszewski, K.; Editor. Controlled Radical Polymerization; ACS Symp. Ser. 685: held 13-17 April 1997, in San Francisco, 1998. (6) Matyjaszewski, K.; Editor. Controlled/Living Radical Polymerization. Progress in ATRP, NMP, and RAFT; ACS Symp. Ser.768: New Orleans, 22-24 August 1999, , 2000. (7) Matyjaszewski, K.; Editor. Advances in Controlled/Living Radical Polymerization; ACS Symposium Series 854: Boston, 2003. (8) Matyjaszewski, K.; Editor. Controlled/Living Radical Polymerization; ACS Symposium Series 944: Washington, DC August 27 to September 1, 2005, 2006. (9) Matyjaszewski, K.; Editor. Controlled Living/Radical Polymerization; ACS Symposium on CRP: Philadelphia August 17-21, 2008 2009; Vol. 1023 and 1024. (10) Matyjaszewski, K. ACS Symp. Ser. 2012, 1100, 1-13. (11) Wang, J.-S.; Matyjaszewski, K. Macromolecules 1995, 28, 7572-7573. (12) Davis, K. A.; Matyjaszewski, K. Statistical, Gradient and Segmented Copolymers by Controlled/Living Radical Polymerizations; Springer Verlag: BERLIN, 2002. (13) Matyjaszewski, K.; Xia, J. Chem. Rev. 2001, 101, 2921-2990. (14) Kamigaito, M.; Ando, T.; Sawamoto, M. Chem. Rev. 2001, 101, 3689-3745. (15) Tsarevsky, N. V.; Matyjaszewski, K. Chem. Rev. 2007, 107, 2270-2299. (16) Hawker, C. J.; Bosman, A. W.; Harth, E. Chem. Rev. 2001, 101, 3661-3688. (17) Barner-Kowollik, C.; Davis, T. P.; Heuts, J. P. A.; Stenzel, M. H.; Vana, P.; Whittaker, M. Journal of Polymer Science, Part A: Polymer Chemistry 2003, 41, 365-375. (18) Perrier, S.; Takolpuckdee, P. Journal of Polymer Science, Part A: Polymer Chemistry 2005, 43, 5347-5393. (19) Moad, G.; Rizzardo, E.; Thang, S. H. Australian Journal of Chemistry 2005, 58, 379-410. (20) Moad, G.; Rizzardo, E.; Thang, S. H. Australian Journal of Chemistry 2006, 59, 669-692. (21) Sciannamea, V.; Jerome, R.; Detrembleur, C. Chemical Reviews 2008, 108, 1104-1126. (22) Zetterlund, P. B.; Kagawa, Y.; Okubo, M. Chemical Reviews 2008, 108, 3747-3794. (23) Cunningham, M. F. Progress in Polymer Science 2008, 33, 365-398. (24) Moad, G.; Rizzardo, E.; Thang, S. H. Polymer 2008, 49, 1079-1131. (25) Braunecker, W. A.; Matyjaszewski, K. Progress in Polymer Science 2007, 32, 93-146. (26) Matyjaszewski, K. Macromolecules 2012, 45, 4015-4039. (27) Pintauer, T.; Matyjaszewski, K. Encycl. Radicals Chem., Biol. Mater. 2012, 4, 1851-1894. (28) Kharasch, M. S.; Kuderna, B. M.; Urry, W. H. Journal of Organic Chemistry 1948, 13, 895-902. (29) Curran, D. P. Synthesis 1988, 489-513. (30) Minisci, F.; Fontana, F.; Araneo, S.; Recupero, F.; Banfi, S.; Quici, S. Journal of the American Chemical Society 1995, 117, 226-232. (31) Fischer, H. Journal of the American Chemical Society 1986, 108, 3925-3927. (32) Fischer, H. Chemical Reviews 2001, 101, 3581-3610. (33) Lingane, J. J. Chem. Rev. 1941, 29, 1-35. (34) Rorabacher David, B. Chem Rev 2004, 104, 651-697. (35) Vlcek, A. A. Coordination Chemistry Reviews 1982, 43, 39-62. (36) Kochi, J. K. Science 1967, 155, 415-424. (37) Bjerrum, J. Metal Ammine Formation in Aqueous Solution. Theory of the Reversible Step Reactions, 1957. (38) Szwarc, M. Nature 1956, 178, 1168-1169. (39) Matyjaszewski, K.; Lin, C. H. Makromolekulare Chemie, Macromolecular Symposia 1991, 47, 221-237. (40) Litvinenko, G.; Mueller, A. H. E. Macromolecules 1997, 30, 1253-1266. (41) Otsu, T. J. Polym. Sci., Part A: Polym. Chem. 2000, 38, 2121-2136. (42) Boutevin, B. J. Polym. Sci., Part A: Polym. Chem. 2000, 38, 3235-3243. (43) Bamford, C. H. Redox Initiators; vol. 3 of Comprehensive Polymer Science, Permagon Press, 1992. (44) Kato, M.; Kamigaito, M.; Sawamoto, M.; Higashimura, T. Macromolecules 1995, 28, 1721-1723. (45) Wang, J.-S.; Matyjaszewski, K. Journal of the American Chemical Society 1995, 117, 5614-5615. (46) Pintauer, T. Eur. J. Inorg. Chem. 2010, 2449-2460. (47) Georges, M. K.; Veregin, R. P. N.; Kazmaier, P. M.; Hamer, G. K. Macromolecules 1993, 26, 2987-2988. (48) Hawker, C. J.; Bosman, A. W.; Harth, E. Chemical Reviews 2001, 101, 3661-3688. (49) Studer, A.; Schulte, T. Chemical Record 2005, 5, 27-35. (50) Grubbs, R. B. Polym. Rev. 2011, 51, 104-137. (51) Tebben, L.; Studer, A. Angew. Chem., Int. Ed. 2011, 50, 5034-5068. (52) Poli, R. Angewandte Chemie, International Edition 2006, 45, 5058-5070. (53) Hurtgen, M.; Detrembleur, C.; Jerome, C.; Debuigne, A. Polym. Rev. 2011, 51, 188-213. (54) Matyjaszewski, K.; Gaynor, S.; Wang, J.-S. Macromolecules 1995, 28, 2093-2095. (55) Moad, C. L.; Moad, G.; Rizzardo, E.; Thang, S. H. Macromolecules 1996, 29, 7717-7726. (56) Yamago, S. Chem. Rev. 2009, 109, 5051-5068. (57) Rizzardo, E.; Chiefari, J.; Mayadunne, R.; Moad, G.; Thang, S. Macromolecular Symposia 2001, 174, 209-212. (58) Destarac, M.; Charmot, D.; Franck, X.; Zard, S. Z. Macromol. Rapid Commun. 2000, 21, 1035-1039. (59) Barner-Kowollik, C.; Blinco, J. P.; Destarac, M.; Thurecht, K. J.; Perrier, S. Encycl. Radicals Chem., Biol. Mater. 2012, 4, 1895-1929. (60) Destarac, M.; Brochon, C.; Catala, J.-M.; Wilczewska, A.; Zard, S. Z. Macromolecular Chemistry and Physics 2002, 203, 2281-2289. (61) Quiclet-Sire, B.; Zard, S. Z. Topics in Current Chemistry 2006, 264, 201-236. (62) Goto, A.; Fukuda, T. Progress in Polymer Science 2004, 29, 329-385. (63) Wayland, B. B.; Peng, C.-H.; Fu, X.; Lu, Z.; Fryd, M. Macromolecules 2006, 39, 8219-8222.